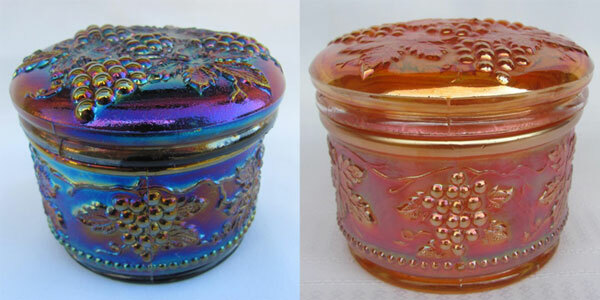 It is believed that Dugan produced perfume bottles and covered powder jars in the earlier years, but the bowls and plates were produced by Diamond. The reasoning behind this assumption is that there are celeste blue bowls found and this color was introduced around 1916, long after Thomas Dugan left the company. For many years the small perfumes (approx 4 3/4″ high) were considered Northwood and thought to be part of Northwood’s dresser set. However after finding old catalogs that pictured them with other known Dugan patterns, there was finally proof that Dugan was the manufacturer. 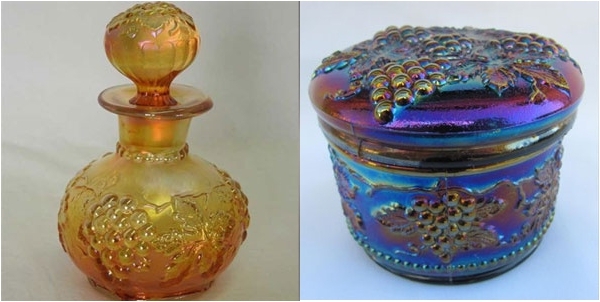 The pattern on both the perfume and powder jar are identical: the grape leaf protrudes from under the bunch of grapes and there is no cable. 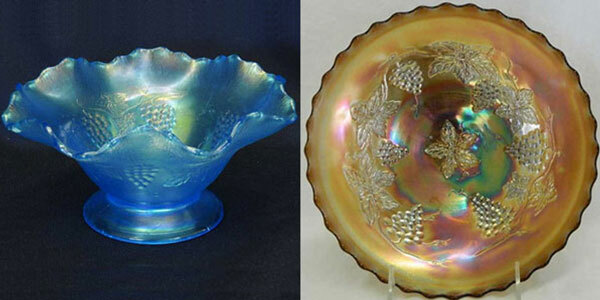 The bowls and plates are dome footed, measure about 9″ to 9 1/2″ across, and the grapes and leaves patterns are more concentrated in the middle. The exterior patterns are smooth, but there is a report that some may have a compass exterior. The bowls have 8 ruffles or are ice cream shaped (ICS).